Back in 2003 I was coming off a failed startup and worked a couple of contract software development gigs while looking for a steady job. Oh, and I was building a new house at the time too. I was the general contractor as well as the guy with the hammer in hand. Busy busy. The first permanent-position offer I got was at Amazon.com, as a senior-level software developer. Can’t recall the exact details of the offer, but it was a pretty good opportunity. I got a new-hire benefits packet in a brown folder along with the offer. Unfortunately, I lived in Portland, and the job was in Seattle. Building a new house and immediately moving to Seattle seemed a bit rash. I declined the offer, which included AMZN stock in the deal. AMZN has increased over 300% since then. The job I took instead didn’t require relocation, and didn’t have stock. I stuffed the benefits folder in a file cabinet and forgot about it. Fast forward to today, and I have a shiny new Kindle 3 (which is a fantastic device, BTW). Knowing that I’ll be carrying this e-book reader around quite a bit, throwing it in bags & such, I started to get a bit worred about the screen getting damaged. I’m a DIY kind of guy, so I thought I’d just make a case myself instead of buying one of the lovely manufactured case options out there. I had just recently emptied out that file cabinet and recyled the folder, and in a moment of serendipity I came up with the idea of using the Amazon.com folder as DIY case material. Unearthing the folder from the recyle bin took longer than turning it into a case. Three minutes, some scissors, and bunch of packing tape later … behold the most expensive Kindle case ever. I’d provide instructions, but I think you can figure it out yourself. Man, and I just bought a Kindle and ate the $60 price of the lighted leather case. When will I LEARN? Beautiful! Better than any Kindle case I’ve seen! 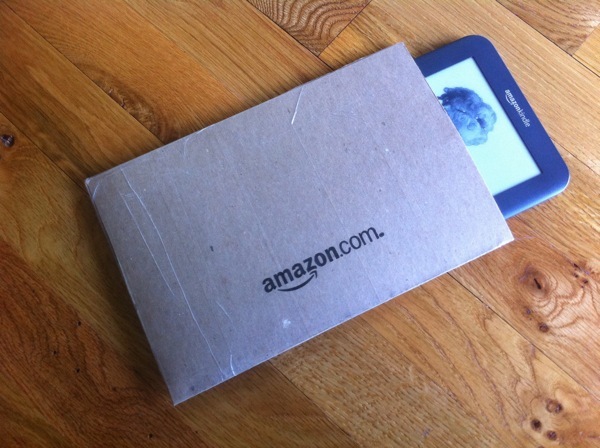 Pingback: The Most Expensive Kindle Case…Bazinga!